(The Wrap-Up Magazine) A frail-but-feisty great-grandmother with a long white ponytail was evicted from her apartment Friday, in part for being too loud. Evelyn Heller of Palm Desert, Calif., was ordered to pay $616 in prorated rent and more than $800 in court and lawyer’s fees. “I’m 100 years old!” Heller shouted at the judge before turning her attention to a lawyer on the other side of the courtroom. 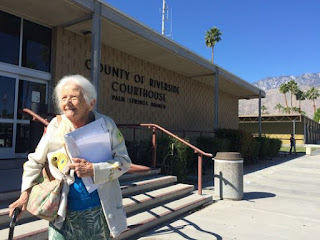 “And I don’t understand what they are talking about.” Despite reluctance voiced by both the judge and the plaintiff’s lawyer, Heller was ordered out of her home after a brief trial. She now has about two weeks to leave her apartment and said she does not know where she will go. “I have four grandsons, but I don’t want to be dependent on them,” Heller told the judge. “I can’t be a burden to my family. They don’t have room for me. That happens in life.” Officials for Heller’s landlord, Deep Canyon Desert LLC, said they wanted her evicted because her apartment was kept in “deplorable conditions” and that Heller often had loud, disruptive arguments with her daughter. The company had threatened to evict her twice before but nothing improved, so representatives followed through this time. The apartment complex manager, Melody Morrison, told the judge that Heller kept the apartment in “deplorable conditions.” A Desert Sun reporter who visited the apartment Friday afternoon found the carpet dirty and the living room cluttered with boxes and stacks of magazines but far from the point of hoarding. After court, Morrison declined to comment then walked briskly away from a reporter to avoid questions. The company’s lawyer, eviction specialist William Windham, said his client did not want to evict Heller but felt it was a reality of the business.